If I’m being totally I honest I don’t do the business look very well. I tend to turn up at work looking a bit scruffy. I like to wear my hair tousled and a bit wild and I’m not much of a morning person so perhaps my AM beauty regime doesn’t get all the care attention that it should when I’m tumbling out of bed with only 15 minutes to go. But it’s so important to make the right impression at work, especially in these financially difficult times, so if you are going to a big interview or just looking to get a pay rise you have to look the business. As I said this isn’t my strongest part of my make-up repertoire, so on this occasion I called in a bit of assistance from professional make-up artist Cassie Lomas, (see below for details) to show me a few quick tips that could be put together in a short space of time or even on the way to work (not when driving though please ladies). You don’t want to have too much on your skin but you do want to have a radiant finish so I’ve been using a Dior Skin Flash Primer (this is an absolute must-buy product) you just put it on parts of your skin where you really want to pick up the light – so it’s the tops of your cheek bones, down the centre of your nose and it gives you that gorgeous glow (but not shine) that will last throughout the day, and also apply over the Cupid’s Bow of your lip (I love that term), and it gives you a lovely full pout. It’s important not to over do your eyes when going to work; you shouldn’t use too much make-up when you are at work. Just a basic eyeliner should suffice, I use Clarins Waterproof Eyepencil. If you use a waterproof one it’s going to last you a lot longer because at work you won’t have time to keep re-doing it – but hopefully you’re not going to be crying at work so the non-waterproof one should be fine as well. Apply the Kohl all the way along the lash line, you can even be quite scruffy with this because you will be blending it in. Kohl pencil is much easier to work with in the mornings than a liquid one. Liquid eyeliner has to be done perfectly to make the right impression and I find myself rubbing it out several times before I get it right, so I really don’t have time for that when I’m rushing to get to work on time. Also the end result looks like you’ve made a bit too much effort and it’ll look like you fancy the boss, and you might end up making some co-workers jealous. 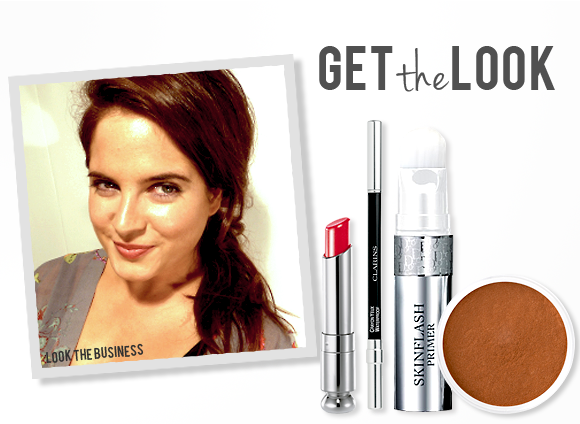 The Kohl will give a bit of smoke on the eye without being over the top. It’s good to have a bit of colour as well so I’ll put on some BareMinerals All Over Face Colour in Warmth and you just dust it with a brush to bronze up all the skin, don’t forget to take it down your neck and onto your chest a bit as well to make it all look even. For the lips, to keep in with the simplicity of the eyes, Cassie advised me to have a bit of a punchy lip colour. This is a little bit away from the regular Binky look but I went with it for an experiment, she suggested the Dior Addict Lipstick in New Look which has a really gorgeous sheen to it and also gave great moisture to my lips. It’s a red colour but it’s soft so it doesn’t look like you’ve made too much of an effort. Like I said it’s not my normal shade but it worked, it gave impact to an otherwise business-like look but without looking too glam. So that was all done in around 10-15 minutes, which is about all I normally leave myself before I have to go hurtling out of the door. I would advise you spend a bit more time if you are going for that “big” job interview but the rules are the same and there’s only four products needed so you can just keep them in your bag in case of emergencies. So bat your eyelashes, use your feminine charms (but not too much) and good luck with the interview/promotion/pay-rise – you deserve it, and if you look the business you’ve stand a much better chance. I want to say a big thank you to Cassie Lomas and her assistant Hannah for the helping me with my blog and with the vlog we did at MSN. If you want to study to be a professional make-up artist have a look at the Cassie Lomas Makeup Academy @clmacademy – Cassie is fantastic and has worked with lots of A-list names. She was the head hair and make-up stylist on the previous Lady Gaga tour! 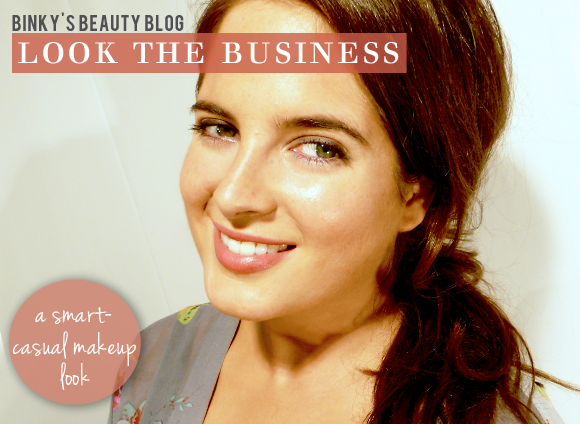 This entry was posted on Friday, September 7th, 2012 at 1:26 pm and is filed under Binky's Beauty Blog #BBB, Make-up. You can follow any responses to this entry through the RSS 2.0 feed. You can skip to the end and leave a response. Pinging is currently not allowed.